Many new electronic producers shy away from sequencing and craft their productions from extensive loop libraries instead. MIDI sequencing using Virtual Instrument plug-ins is a powerful way to customize and create, but if you don’t have a background in music performance, it can be intimidating to get started. Thankfully, modern tools make sequencing intuitive, fast, and, most importantly, easy to learn. One of the most flexible tools in a new producer’s arsenal is the Pattern Sequencer. Also known as “Step Sequencing,” Pattern Sequencing lets you create a beat using a grid. In the above image, the width of the rows is defined by the length of the pattern and each square in each row represents a defined note value, in this case, a quarter note. In most modern electronic music, the time signature is 4/4. That is, each measure consists of four quarter-note beats. The number on top in a time signature is the number of beats per measure and the number on the bottom is the note value of each beat. What is important to remember when using a Pattern Sequencer is that any note value you select will be displayed as the subdivision of the grid and the grid can be any length you choose. In the image in our example, the pattern will be 16 quarter notes in length, or 4 measures of a 4/4 time signature. However, it doesn’t have to be. You can choose to make your pattern any number of notes long. In fact, creating a pattern that doesn’t easily subdivide over a standard two-, four-, or eight-bar length can form an interesting sequence that evolves over time, so don’t be afraid to experiment. Using the Studio One Pattern Editor, you are not locked to static blocks of note data. You can create endless variations which are stored within the Pattern. This lets you start with an idea and create iterations that you can easily switch between as you lay out your arrangement, bringing life to your sequences over time. Because Patterns function as events in the Studio One timeline, they can exist right alongside live sequences. This gives you the flexibility to blend real-time linear sequencing with Patterns. 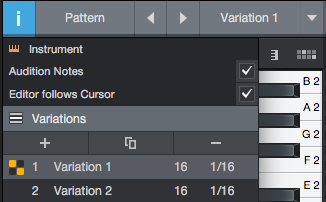 Studio One also offers two different modes of Pattern sequencing: Rhythmic and Melodic modes. In Rhythmic mode, each sample is given its own lane that in turn can have its own pattern length (Steps) and Resolution (note value) setting. In this way, your kick drum pattern can be defined as 16 1/4-note counts long, while your high hats can be defined as 12 1/8-note counts long in the same pattern. This mode automatically engages when a pattern is inserted on an Impact XT track. Swing. By default, this is set to 0% so that each note in the pattern is played with metronomic precision. As you increase the percentage, the second step of each pair (2, 4, 6, and so on) is moved closer to the note to the right of it. This is a great way to adjust the “feel” of a pattern. Gate.The Gate value lets you shorten the note length, without changing the note value. As you lower the percentage, each note in the pattern is truncated to create a more staccato effect. Accent.This allows you to increase the amount of emphasis that is placed on Accented notes. As you increase the value, so too is the accent. The Studio One Pattern Editor offers some flexible tools when creating new patterns and variations. By clicking on the Inspector, you can view all the variations you’ve created for a particular pattern. Add New. If you want to create a completely new theme using the same instrument, the Add New feature lets you quickly experiment with a new thought. Duplicate.If you want to create a variant of a pattern you’ve already created, don’t start from scratch; copy it! This is great for adding new components, but it’s also a quick way to create an intro or an outro. For example, if you’ve created a loop with a pick-up beat at the beginning, you may not want those first few notes in your song’s intro. Creating a duplicate lets you delete them without a lot of hassle. Follow Cursor. Enabling this feature will let the pattern editor follow you as you navigate the song, making it easier to add new variations and modify them. Velocity. By default, all the notes in a new pattern will hit at the same velocity, but that can get a little boring. This control allows you to adjust the velocity of each note on given lane (Rhythmic mode) or step (Melodic mode). Repeat. From here, you can specify the number of repeats for each note in the selected lane (Rhythmic mode) or to all notes on a given step (Melodic mode). This is a great tool for creating build-ups. Probability. This control lets you evolve your pattern with minimal effort by letting you specify the percentage of probability that each note in the selected lane (Rhythmic mode) or all notes on a given step will play (Melodic mode). Higher values cause notes to be canceled more frequently, creating more interesting variations as the pattern plays. Get started with Pattern sequencing by downloading Studio One Prime for free today.